(Norman Vincent Rennells Ulery remains Brown County’s “Culturally Isolated” and “Outsider Artist” when it comes to his Fine Art). 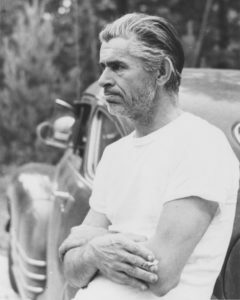 Norman described his California years as living in a foreign land; he longed for Indiana. He knew Brown County to be a well known art colony. September 1947, my parents loaded up their two-door Model A Ford with a few belongings: clothes, bedding, Norman’s paintings, and their cat. They set off for Nashville, Indiana. They rented a cheap cabin with cracks around the windows; only a fireplace for heat, back drafts of dust and soot. It was a bitter winter, and they were often hungry. They had just enough cash to buy land. Between October 1947 and March 1948, they cleared some woods and built a 9 by 12 room. They moved into their “Red Shed Studio” on Easter Sunday 1948. 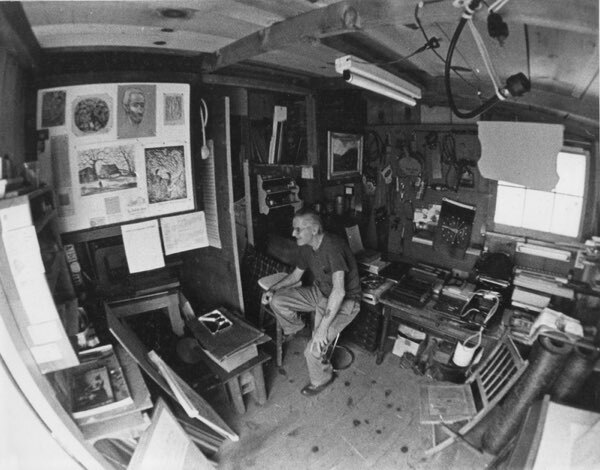 Norman expected a communal fellowship of artists in Brown County. He longed for a life among artists such as he had experienced in the Hollywood Arts Students League. No such group existed, and no one was interested. A.J. (Jack) Rogers, who owned most of the town’s business enterprises, was looking for a sign painter. The advertising signs for all of Jack’s business establishments: The Nashville House, The Country Store, and almost all other signs in town were designed and painted by Norman. He originated all the old-fashioned character advertising for the Nashville House. At first, my parents didn’t have electricity so Norman designed and produced all his illustrative work by a “coal oil” lamp at each end of his drawing board. The morning the Brown County Playhouse (operated by Indiana University) was to have its initial opening, Jack Rogers said: “Ulery, there’s no sign. No way people will know this is a playhouse. What can we do?” Norman bought oilcloth and by evening, the first poster, “The Old Soak,” was hung in front of the theatre. Until his first heart attack in 1968, Ulery did three posters a year, and designed and produced the playbills. Today, some posters hang from the rafters of The Nashville Old Country Store and inside the Playhouse. Without Jack Rogers and my mother’s sacrifices cleaning, cooking and child-sitting for affluent Brown Countians, my parents could not have survived financially and my father could not have continued this passion for Fine Art.